I love stools! 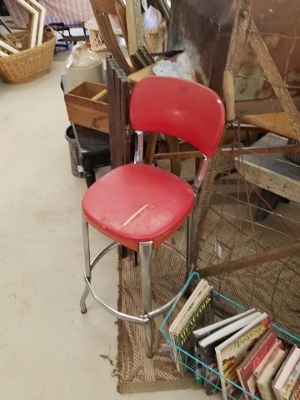 I almost thought about buying this one until I looked a bit closer to see that the seat wasn’t in good shape and had been patched together with yellow duct tape. 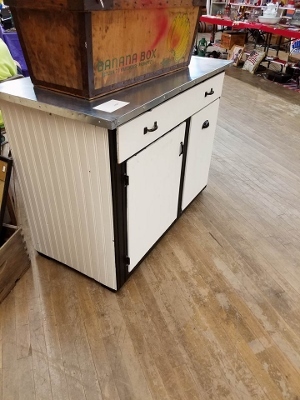 Then I saw this one and thought it would look perfect in my kitchen, but again not in the best shape for the price they were asking. I really liked this little plant stand/end table and thought about getting it for my living room, but realized the reason I loved it was the green color and green would look extremely out of place in my living room. But this was probably one of my favorites of the day! 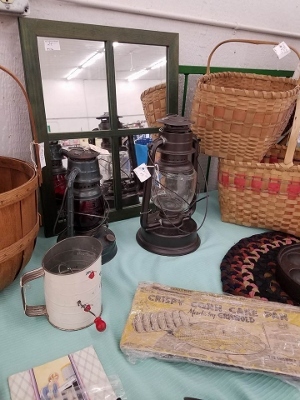 I have always liked lanterns, but don’t quite know how to display them or make them look cool so I passed. If you have any ideas, feel free to send them my way. I’m a bit worried that I’m on the backside of the lantern trend though, so getting a real, authentic one might be a bit on the spendy side. I loved this! I have a weakness for anything with beadboard or car siding. 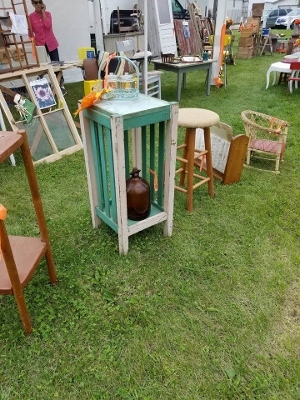 I really liked the simplicity of this peice, however I can either have it or my butcher block and I picked butcher block–Plus–If Jason had to move that butcher block again, I think he’d kill me. It ended up taking them three guys to get it in my house, so I don’t think it’s ever gonna leave. 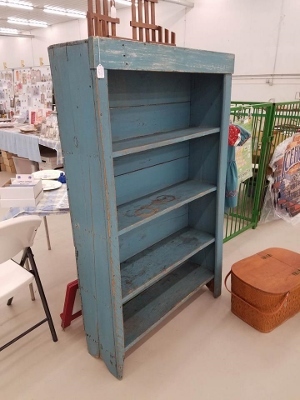 This blue shelf caught my eye too! I think that my favorite part was the worn shelving and the rings that you can see from being used. I’m betting that this was in a basement somewhere, dragged out, and almost sent to the dump. Usually, I’m not too big of a fan of blue, but I like this color as it’s a bit more bright, but not screaming bright blue. This was my favorite find of the day! 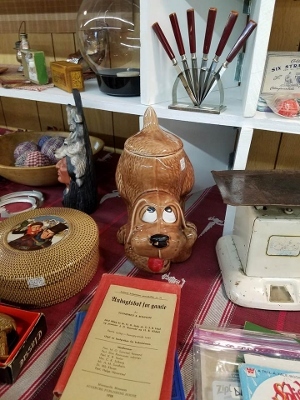 A dog cookie jar and if it would have been a beagle, it would have come home with me. I’ve still got my eye out for a beagle cookie jar but haven’t found one quite yet. Did I end up getting anything? I bought two baskets for 50 cents each that I’ll use to store and transport parts and peices of quilts. Nothing fancy, but sometimes that’s okay. What was the best part of my weekend though? Definitely meeting Mr. Carver! 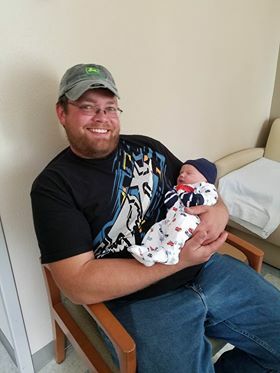 Jason even went up to the hospital with me to meet him. I would have to say I think these two are probably my favorite two guys! This entry was posted in Uncategorized on September 21, 2016 by Kelli. 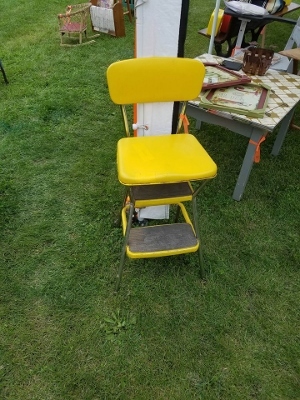 We had one of those yellow stools – I didn’t realize it was an antique! My parents got it for me so I could reach the top cupboards in my apartment. After I got married it became steps for our swimming pool, a high chair alternative and lots else. We left it in the house (along with a lot of other things) when we moved from Ohio to Arizona. That show looks like it was fun! You made a good choice to go and see that precious baby first though! I have a passion for bargains & beadboard too!! I once bought a beadboard cupboard for $1 because it was covered with contact paper and no one bothered to peel a corner back..! But your biggest Score is that precious grandson Carver❤️ Grandsons are the best!! I finally threw away my mom’s yellow step stool because it was so wobbly. My mom is less than 5 feet tall, and she liked to stand on that rickety thing to reach into her washing machine. Not a great idea when you are 78. I waited until she went out. Then I went to Home Depot and bought her a very sturdy step stool. I put her old on in my car and took it with me to my house, 2 hours away. I never told her. A week later she asked me what had happened to her step stool. I told her I took it home and threw it out because if I had tried to throw it away at her house, she would have pulled it out of the trash. She just laughed.